1. Combine the 3 dals and rice together. 2. Soak them for a few hours. 3. Drain the water and grind with dry red chillies to a coarse batter. 4. Add ginger, curry leaves, onion to the batter and mix well. 5. Add salt and mix again. 6. Heat a tawa over moderate flame. 7. Pour a ladleful of the batter and spread to a thick round. 8. Add oil around the edges and cook till done. 9. Cook on both sides till crisp and golden. 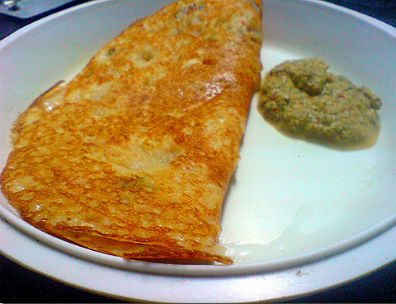 Feel free to comment or share your thoughts on this Onion Adai Recipe from Awesome Cuisine.